‘Reduce, reuse, recycle’ is probably one of the most important buzz terms to come out of the 21st century. And while the concept itself isn’t necessarily a new one, the phrase really is easy to remember, seeing as its sing-song sound reminds us of what to do when shopping. And, while we should all be committing to the first two words (reduce and reuse), so as to avoid using the last (recycle), making the conscious decision to recycle is a powerful one. To make it easier, we list the best recycling companies in Cape Town and Johannesburg, this includes collection as well as drop off points. The average South African generates around 700 g of waste every day, amounting to about 42 million cubic meters of waste being accumulated across the country every year. Simply, 1 ton of waste fills up a 3x2m² room right up to the ceiling. Just let that sink in. In this day and age, with the realisation of the effect that our modern lives have on the environment, there is actually no excuse for not acknowledging that impact. If you’ve made the decision to recycle, but are not sure where to start, we’ve put together a handy little guide to make it all a little more simple. Firstly, what can be recycled? Metals, plastic, paper and glass are the general categories, with a number of products falling under these sections. Metals include cold drink and beer cans, food cans, the metal lids from glass jars, even aluminium cans are recyclable, as well as aerosol (that’s your deodorant) and paint cans. Plastics, being made from a non-renewable resource, are pretty much all recyclable. 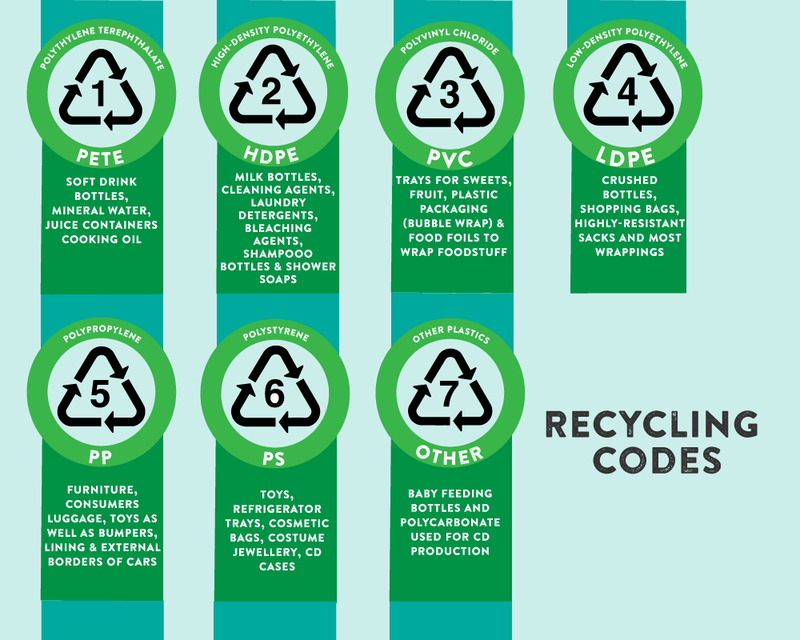 There are a few plastics, however, that are not recyclable, namely polystyrene, PVC or vinyl, and anything that has an identification code 07. These items are things like nylon products, childrens’ plastic toys, sunglasses and plastic cutlery to name a few. Paper, provided it isn’t waxy or laminated, or coated with foil (like Tetrapak), can all be recycled. This includes magazines, cardboard and cereal boxes, newspapers and regular printing paper. Nearly all glass products, like food jars and beverage bottles, are recyclable but light bulbs and drinking glasses are not. It’s worth noting that fluorescent light bulbs should not be thrown away with your regular rubbish as their mercury content is toxic and can leach into the groundwater. Either take them to a large supermarket nearby, who almost always have deposit bins for them, or contain them in a plastic bag before throwing them in the bin. What about your garden waste? Have you done some weekend gardening? Been landscaping? Your garden waste can also, and should definitely be, recycled. The best part about it is that all the goodness of that organic matter can be returned to your garden in the form of healthy, nutrient-filled compost. Capetonians, drop your garden waste at any one of these drop off points and help divert it out of landfill. Now you know what can be recycled, the next step is knowing how to recycle. The best thing is to get into a habit of checking if the packaging can be recycled, rinsing it out if it’s dirty and simply popping it in a separate bin, lined with a clear plastic bag. Now it’s time to decide how you’re going to get rid of your recycling. Admittedly recycling is not the easiest thing to do in South Africa, but the demand for it should make it more accessible in the near future. In the meantime, however, here are a few companies who offer kerbside collections at your house. Mr Recycle is a genius operation that allows you to decide just how much recycling you want to be picked up every week and you pay according to that. There are options of 1, 2 and even up to 4 bags per week. The company then comes by after work hours to pick up the bags. Mr Recycle also prides itself on helping the community, as well as the environment, by employing commercially unemployable staff and offering them an opportunity to earn a living. Clearer Conscience sorts out pretty much every area of Cape Town from the CBD to the suburbs, meaning there is no excuse not to recycle. They also offer reasonable rates, as well as flexible collection dates so that you can personalise your service to suit your needs exactly. Think Twice is a municipal initiative that offers a free (yes, you heard right, free) collection service to a number of different areas across Cape Town. All that is required is for residents to double check that their area is covered, and then place their recycling out in a clear plastic bag with their regular rubbish bins, on collection days. Abundance Recycling will collect recycling material from your home in Cape Town on a weekly basis and is delivered to a reputable recycling depot where it will be sorted and dispatched to the recycling manufacturers. If you’ve claimed to be too busy, or that recycling is expensive, there really is no excuse not to recycle anymore. These businesses have made it easy and affordable to get rid of your recyclables, and will even tailor their services to your schedule. Contact any of the above recycling companies in Cape Town and get started! Whole Earth will come to your home, office or complex and, for a reasonable fee, pick up your recyclable goods. You don’t have to worry about sorting anything either, as they will do that for you, just ensure that everything is clean. The best thing about Whole Earth is that it supports a group of sorters who are able to keep all the money made from the sale of the materials. Ecomonkey offers a similar service, covering most of Johannesburg’s suburbs. Their fees for home collection start from as little as R85 a month, making them an affordable option to go for. Once you’re signed up, Ecomonkey will come past your house once a week between 07h00 and 18h00 to whisk your recycling away. Mama She’s Waste Recyclers offer a very simple and affordable system, where you buy 20 of their blue bags for R20. You then use these bags for your recycling, which they come by and pick up. Send them an email to get started. Reduce, reuse, recycle is not only a singalong phrase, it’s also a mantra of sorts. Instead of recycling being your first port of call, consider reducing and reusing first. Single-use plastics, such as food containers, are only going to be used once and when you’re done with them, you will dispose of them. But be aware that the entire package may not be recyclable. If there is a film sealing it or any polystyrene, it can’t be recycled. Think about reducing your intake of plastics and single-use packaging as a whole – is there another option for you to buy what you need that doesn’t involve waste? For instance, don’t buy prepped butternut, buy a whole one and skip any plastic containers. It’s also cheaper to buy whole produce. Introduce reusing into your life too, don’t just recycle every yoghurt container you buy, wash it out and use it as a storage container. This will also save you money because you won’t need to buy as many storage containers. We live in a fantastic modern world, where everything we could ever want is right at our fingertips, but at what cost to the environment? Your super-efficient coffee capsules may make a great cuppa joe, but the packaging isn’t recyclable so those little pods are literally clogging up our environment. It’s so handy to be able to eat your takeaway with plastic cutlery, but what happens to them after you chuck them in the bin? You need to be asking yourself these small, everyday questions. We need to do something if we’re going to protect this wonderful planet we live on, so why not start doing that in your own home.